First of all - I thank you all from the bottom of my heart for all of your prayers and warm notes on the last post. I spent Sunday morning with Brie's family and friends at a church service where prayers and blessings were offered. There was not a dry eye anywhere. Her memorial service is tomorrow - details here. I am honored that they asked me to take care of the flowers for the occasion. Brie shared my love of flowers. I brought a dozen or so pictures of flowers to her hosptial room for her to put on the walls so she could have a garden in her room. I've been having a hard time focusing on anything for very long lately - but I have been knitting and spinning. 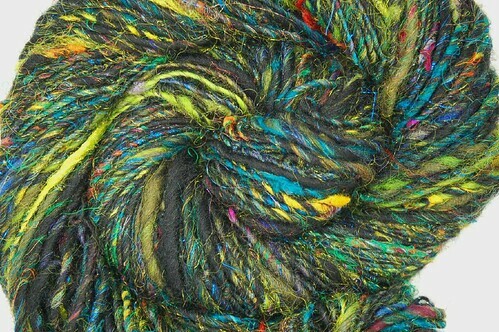 I got 2lbs of roving at MD Sheep and Wool to make a handspun sweater.... I finally spun up and soaked my first batch. I just love the warm natural brown of this yarn. I can't wait to spin some more. I also spun up other Loop batt. This was fun to spin! I love all the little bits of color. I also joined Loop's Batt of the month club. Next month's theme is butterflies. Steph sent us all pictures of butterflies and we had to chose the one we like best. I chose a Monarch butterfly. 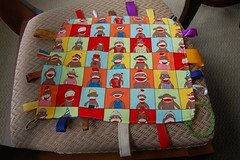 I can't wait to see how she interprets it in fiber! And guess what! 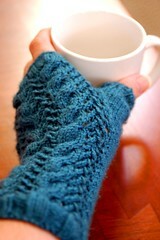 My Merletto Mitts are the subject of a June Knit-a-long on Ravelry! The Fingerless Glove Fanatics group is knitting them. 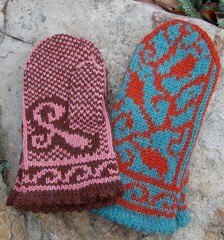 There are lots of great looking mitts being knit over there - go check it out! I couldn't just sit and watch - I of course started up again on another pair. 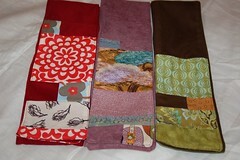 I gave the originals to Jolene - so I need some for myself! I'm also still knitting the Printed Silk Cardigan. The entire back is done and I love it! 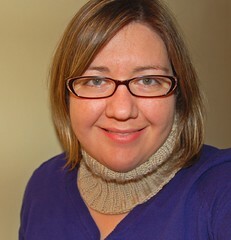 Also - I cast on for a new shawl - the Adamas Shawl. It's all Sarah's fault. No pictures yet - but soon! This is going to be a quicky! so sorry to hear about Brie,...My prayers are with you and the family... that Loop is awesome! Bringing pictures of flowers to the hospital is such a good idea. So thoughtful, so like you! 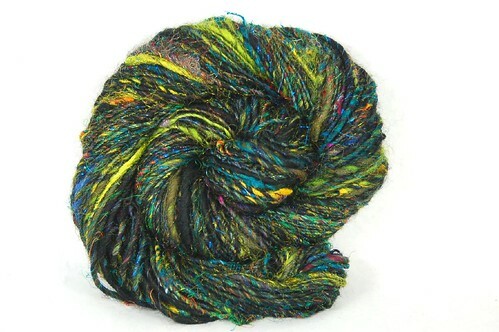 Beautiful handspun. 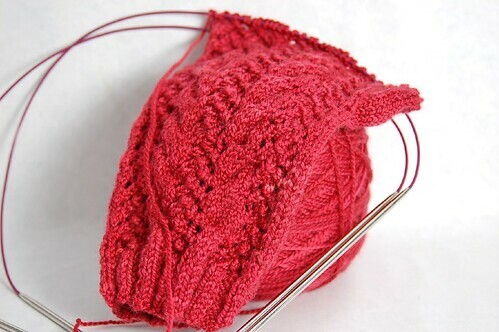 It will make an amazing sweater. 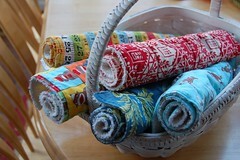 Cool about the KAL! Maybe I should join in ... and give myself an extended deadline, like oh by the end of the year. More hugs and prayers for you! What a wonderful idea to have those flower pictures in her room, so touching and I'm sure made her happy! I'm glad you are doing better! Been thinking about you and Brie's family. Please give her mom a hug from me! That black and colored yarn is so pretty! I'm sure the flowers will be spectacular!!! 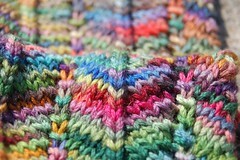 The brown sweater yarn - wow - that is going to be so pretty with the other colors! I've been out of it too. I came to work this a.m. for a 7.30 meeting. oops! It's next Wednesday. 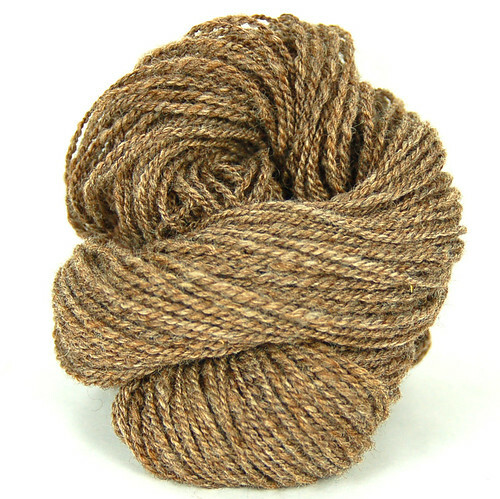 Love the brown handspun. 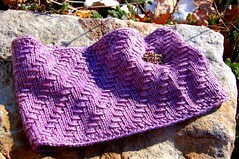 Your knitting and patterns and handspun are an inspiration. i totally missed that you started the Printed Silk Cardigan. It's a great knit! I hope the service goes ok. I'm sure you will choose some wonderful flowers. I'm not surprised you did the flowers for Brie, Jody. They were perfect. I was wondering if you took the one of her in the field of daises and a few others too. And huge congrats on the Merletto Knit-a-Long. You must be about ready to bust.